Performance Time: Approximately 60 minutes, 55 pgs. FARCE. Disguised as Professor Alucard (Dracula spelled backwards), Count Dracula takes a teaching position at a small women’s college. 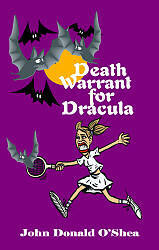 But instead of preying upon hapless Victorian females, Dracula finds himself the victim of an accomplished student athlete, Lucy, who is more than happy to clobber him with her tennis racket and golf club. And if that isn’t bad enough, Dracula encounters a host of zany faculty members including a biology professor who crawls on the floor and eats insects, a music professor who writes horrendous musicals, and a spooky poetry-reciting English professor who has corrected one too many exams. When Dracula is eventually captured, he discovers that modern vampire hunters aren’t exactly “old school.” Instead of simply driving a stake through Dracula’s heart, these “civilized” vampire hunters can’t stand the sight of blood and can’t bring themselves to kill Dracula even though he has been dead for 400 years. To Dracula’s horror, the hunters contemplate even more torturous ways to end Dracula’s taste for human blood like filling his fangs with Super Glue and forcing him to become a vegetarian!